Today’s gospel talks of divorce, and in church it seems to always be a controversial topic. Before I talk about that, let’s first think about what marriage is. The quote from Genesis say that man needs a partner, but if we look at history, the partnership was for the most part not an equal one if we look at how women were seen and treated throughout history. Truly, it has been mostly a man’s world with marriage an arranged and bartered relationship falling short of a real partnership, and often an arrangement lacking in true love of the partners. Even in the western world and our own country the equality of women starting in the late 1800’s is still a work in progress. Partnership in marriage reflects equality and the basis for that partnership is love, and as our faith tells us love is a Godly thing and love for ourselves and others is what makes us grow and love each other and bring us to God. Marriage is a special sign or Sacrament that like all the sacraments works in our life. Living and growing in love for one another in this sacrament brings the lovers and those around them and sharing in that love to God. It shares in the relationship of the Trinity itself. However, humanity is not perfect. Not one of us is without fault or sin. In so many ways we can fail as individuals, and unfortunately those failures can be harmful to others and can bring failure and misfortune into life. Personalities, and any number of things can lead to couples separating or going different ways. Divorce is an unfortunate thing, but when a partnership can no longer be, God’s love is still there for all and his love must always be the guide through this and all of life’s trials and times. 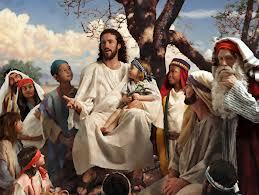 Jesus quoted the law in the gospel for that was what he was asked. 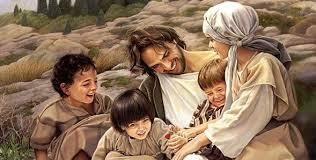 But notice he embraced the children and said accepting the kingdom of God like a child was the important thing. God is the judge, the lover, the one who forgives, always embracing us as we walk the twisted path to his kingdom. Hi love will not ail us. Every once in a while we are awakened into seeing Jesus, the loving shepherd, the paragon of peace, the kindest of the merciful, in another paradigm in which he is very challenging, expectant of perfection, and demanding the impossible. Today is one of those paradigms or shifts of perception. To fully understand today’s Gospel we need a little background and Hebrew history. Jews have always been realists and had always accepted the concept of divorce. Generally Jews feel that it is better to be divorced than to be in a constant state of agitation or pain. That said, they also took marriage very seriously and generally made it hard to divorce. The laws were intricate and complex and even following them placed obligations on the couple. So we have a double sided attitude to divorce. On the one hand, it was very much to the favor of the man who could divorce a wife without her consent for even a small thing, like not having his dinner ready on time, or because he found himself in love with another woman. In fact, he was forced to divorce her, even if he didn’t want to if she committed a sexual act away from him. So the laws favored the men mostly. Except for adulterous wives, the men would have to pay a monetary fee to the woman and could never remarry her. To divorce a wife, the man would have to issue what is called a “get” which states that this woman is free to marry another man. Without that “get” a woman could do nothing, and even with it, there were some Jews who were forbidden to marry her. If the husband went off to battle and died, but there was no proof of his death, the woman would still be considered married and without a get. These rules were so difficult for the woman, that throughout the years the rabbis would put addenda to the law which softened it and even allowed in some cases for the woman to be divorced, if the husband were unable to fulfill his duties because of being paralyzed, for example, or if he refused to carry out his marriage commitments. But that didn’t happen very often in Jesus’ time. Jesus’ comments on divorce today then reflect his understanding of the inequality of the marriage laws of his time, but also the bar of perfection that he brought to every issue – expecting us to be perfect as the father is perfect. The reading from Genesis today is central to Jesus’ understanding of marriage. Jesus understands that the woman was created to be a partner with a man and a helper. Finding this one person who can fulfill that partnership is what we call a marriage. There is no mention here, by the way, of procreation, but only that that partner who was called “Woman” would become one with the other partner. Only later, in the Psalms do we read that that oneness expands to create children, and many children and fruitful wives were seen to be an ideal. 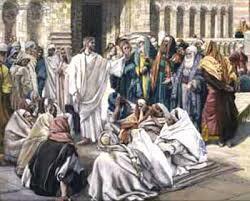 The Gospel then finds Jesus being tested again by the Pharisees. Apparently the test was to see if Jesus knew what was the Mosaic command regarding divorce. Jesus’ answer to them is simply to quote the Mosaic rule, to show that he knew the Law, but then, as he had so many other times, raise it up a notch and attach it to the conscience, to the intent of the act and to to demand even more than the law offered. He says in essence that if God had joined the couple together, no human being should interfere with that. In private with the Apostles he is asked again about what he said because even in Jesus day this would be a contentious subject. His words to the Apostles are the ideal: whoever divorces and marries another commits adultery. In Mark, the earliest Gospel, there is not an exception to this as there appears in other Gospels and in Paul’s writings. Immediately on this pronouncement the talk changes to ‘children’ and perhaps this juxtaposition is really what Jesus was concerned about. In a divorce in Jesus’ time, the woman was the one most hurt, and if the women were hurt, especially financially, so could be the children. Jesus in his concern for the poor and outcast could see the results of divorce acted out in poverty and oppression, and it was for their sakes that he found divorce a bad thing. From the very beginning, though, apostles and church leaders began finding exceptional circumstances and reasons where divorce might be allowable. In the present day, the Roman church issues annulments to get around the idea of divorce, though they still make it difficult a process to go through, which is hopefully under Francis, soon to be more simplified. We agree that the process should not be easy, and we hope couples will try the ‘perfection’ root and fight for their marriages. I did a wedding a few month ago where I preached on the line “the two shall become one flesh” and commented that being one flesh did not mean “one personality” and “eradicating differences”. I used the image that to make a salad one mixed oil and vinegar which really don’t mix unless you shake them up. In a good marriage the couple has to always work at it, work at being one, no matter how long the marriage. I asked the bride and groom to make sure they kept working at it, shaking it up. I think people go the message because all through the reception people would come to me with the line “Shake it up!” I believe that marriages are hard work and that we need to commit to working at it. For those of you who are married, that is perhaps my simple message today: Shake it up! and for those who are not married, know that in choosing to do so, you really need to work at it constantly to achieve that perfect state that Jesus talks about. Something to be aiming for – the perfect marriage. And that is the Good News I suggest to you today around Jesus’ difficult words on a difficult subject! On the one hand, it was very much to the favor of the man who could divorce a wife without her consent for even a small thing, like not having his dinner ready on time, or because he found himself in love with another woman. In fact, he was forced to divorce her, even if he didn’t want to, if she committed a sexual act away from him. So the laws favored the men mostly. Except for adulterous wives, the men would have to pay a monetary fee to the woman and could never remarry her. The reading from Genesis today is central to Jesus’ understanding of marriage. Jesus understands that the woman was created to be a partner with man and a helper. Finding this one person who can fulfill that partnership is what we call a marriage. There is no mention here, by the way, of procreation, but only that that partner who was called “Woman” would become one with the other partner. Only later, in the Psalms do we read that that oneness expands to create children, and many children and fruitful wives were seen to be an ideal. In private with the Apostles he is asked again about what he said because even in Jesus day this would be a contentious subject. His words to the Apostles are the ideal: whoever divorces and marries another commits adultery. In Mark, the earliest Gospel, there is not an exception to this as there appears in other Gospels and in Paul’s writings. Immediately on this pronouncement the talk changes to ‘children’ and perhaps this juxtaposition is really what Jesus was concerned about. In a divorce in Jesus’ time, the woman was the one most hurt, and if the women were hurt, especially financially, so could be the children. Jesus in his concern for the poor and outcast, could see the results of divorce acted out in poverty and oppression, and it was for their sakes that he found divorce a bad thing. From the very beginning though, apostles and church leaders began finding exceptional circumstances and reasons where divorce might be allowable. In the present day, the Roman church issues annulments to get around the idea of divorce, though they still make it difficult a process to go through, which is hopefully under Francis, soon to be more simplified. We agree that the process should not be easy, and we hope couples will try the ‘perfection’ root and fight for their marriages. The gospel today should teach us a lesson that many of us just don’t understand. 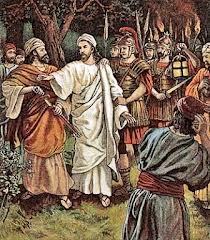 Someone was driving out demons in Jesus’ name and the disciples wanted to stop him. Jesus said leave him alone. He said if the person wasn’t against him he was for him. It is a lesson we need to learn today in an age when Christianity has become so split and divided that it is hard to know who belongs to whom. Centuries of pettiness and misunderstanding and jealousy and many other faults and flaws of humanity have left a very divided and disparate world of Christians. Christ’s word and teaching has been split and divided and taught in many different ways. Some take ownership of Christ’s word, yet interpret that word to their own advantage or point of view. Christ’s arms embraced the whole world and all of humanity, yet even today that embrace has been tempered and trimmed to fit one person or group or another. For centuries we have seen Christian against Christian and ignore the people who have not heard Christ’s word yet believe and follow the God who embraces even them. Condemnation comes Christ told us when one causes a believer to sin. This might sound strong, but what is the opposite of loving if not sin? He called on all of us to love as he loved himself. Suspicion, jealousy and all the other negative things transpiring among the men and women of the world that breaks and injures individuals and our society truly stand in the way of a true union with him. Jesus made it clear that no one owned him to his disciples, and it is so today that following him is not ownership or exclusivity. 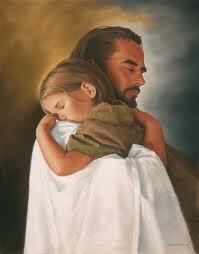 Christ’s love includes us but those arms of his also include all who wish to reach out to him. What we need to remember is that if we truly love him we love also those whom he loves. It is after all He who determines those who belong to him. 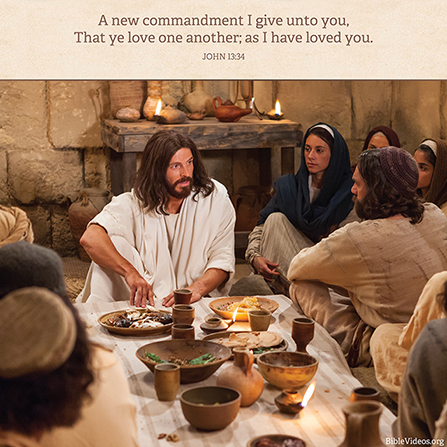 Our task is to love one another as he loves us. Christ died for all and he knows who are his own. It is not ours to judge but to love and show mercy. The First Reading and the Gospel today are both about jealousy. It is a particular type of jealousy in which a person has a gift of some sort and becomes noted for it, and suddenly someone else seems to be doing the same thing and doing it better or worse than the original person did. I used to see it when I taught high school. Some athlete would be the best on his team, became captain and was looked upon by others as the best. Suddenly someone moves into the area and into the school who is also a great athlete. Instead of becoming good friends, the athletes vie with each other to see who is better. I have seen it in my English class when a girl who was a great writer, who always got A+’s and was always given praise by the teacher, suddenly faced a new student who was just as talented. She was very mean to the new girl, jealous of her talent and fearing she would no longer be the best. In the Book of Numbers from the Old Testament, we hear such a story about Moses, but it doesn’t end the same way. The Hebrews saw Moses, not only as a prophet but a great prophet. The Holy Spirit decided to share Moses’s gift with seventy elders in the tent where the Holy of Holies was. Because they were elders, and because he retained the leadership, Moses didn’t feel jealous or challenged. Also, it was part of the religious experience of the tent. Suddenly, the Holy Spirit decided to descend on two common men in the camp outside. They also were given the gift of prophecy and began to do so. When they were heard, one young man ran to Moses and Joshua to tell them that this was happening outside the tent. Joshua was upset about it and told Moses to stop them from prophesying. But Moses, instead of being jealous of having to share his gift, told Joshua that he needed to stop being jealous for his sake. He didn’t mind sharing the prophetic gift at all and wished everyone had the gift. Similarly, in the Gospel of Mark, the apostles run to Jesus with the news that someone was doing exactly what Jesus was doing – casting out devils. Not only that he was doing it in Jesus’ name, which was exactly what Jesus had been trying to teach the apostles to do. Jesus tells them that it is all right, especially because the man is casting out in his name, since the man would always have to respect Jesus name since the devils had been cast out. In both cases, the followers of Moses and Jesus were the ones jealous – not Moses or Jesus. Perhaps we can take the lesson that we should never be jealous of, and, in fact, should team up with, people who have the same talents and gifts as we have, not see them as threats. The rest of the Gospel today is filled with exaggerations which we call hyperboles. Hyperboles exist to make a strong point about something. For example, I tell people I got thousands of tomatoes out my garden this year. Well, I didn’t really, but I got a huge amount of tomatoes – and people understand that exaggeration. Or we say of a restless night – I didn’t sleep all night! – when we probably did fade off a little bit at least – but we get the point! So, when Jesus says that if you do anything to threaten the faith of a child, it would be better if a great millstone were hung about your neck and be thrown into the sea – he is exaggerating – but we get the point. It would be a really, really bad thing! Similarly, if you steal things with your hands, cut off your hand! 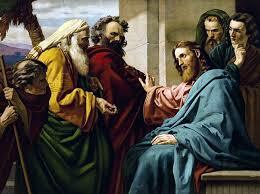 Jesus doesn’t really want you to cut off your hand, but he wants you to treat the inclination to steal very seriously! In the same way, if you have trouble with liquor but find yourself constantly walking into bars, just cut your feet off so you can’t. I mean, Jesus can’t be serious. He is using hyperbole. This, of course, is one of the reasons we can’t take everything we read in the Bible literally. There has to be some common sense interpretation. If we followed Jesus’ instruction here we would all be limbless, and blind. It simply means that we must take these matters seriously – probably where the Catholic church got the concept of “mortal sin”. The last line of the Gospel today may be difficult to understand: “…be thrown into hell, where their worm never dies, and the fire is never quenched.” Jesus is not necessarily saying that hell is a place with fire but is actually using a metaphor here. Hell would be better translated as Gehenna, which was the local garbage pit of Jerusalem. Maggots would be there all the time because of the food scraps, and the fire would always be burning because there was always more trash. So hell is like the maggot-ridden, perpetually smoking garbage dump – a slightly different metaphor of hell than most of us grew up with. This brings me then to the middle reading today from James once again about how hard it will be for rich people to get to heaven. In fact, James uses the image that the riches themselves will rust when you have died and left them behind, but that rust will also be evidence against you as having so many riches, and “it will eat your flesh like fire”. Again we get that garbage dump kind of image with the smoldering fire consuming the refuse. So there is a lot packed into the readings today, but what can we take home with us? Take sin seriously and do your best to avoid it. At some point, you will be called to justify your lifestyle. Don’t strive for power, but share your gifts and talents with everyone, especially those who have the same strengths as you. Work with them. Don’t store up too many riches for yourself for they will come back to haunt you. Little proverbs or mottos or clichés that maybe you can think about this week as we try hard to reach that state of perfection that Jesus tells us we can reach. And this is the snippets of Good News I give you from the readings this week! Today’s gospel has Jesus telling his disciple for the second time that he must suffer and die at the hands of the chief priests and scribes. The idea of suffering and an angry God is a notion that somehow became prevalent and the notion that suffering was very much a necessity for a christian the whole concept of redemption. Taking up one’s cross came to mean to suffer in some painful way to make up for our sinfulness. It became almost that Jesus came only to suffer and die. But then, what of his teaching and preaching, his love and his service and God’s mercy shown through him? God sent his son into the world to confirm his relationship and love for us, especially the lowly, the deprived, the ones who most needed his love. Love certainly involves sacrifice, as in giving of yourself to another you are sacrificing some of what you are and giving it to another. God in giving Jesus was giving his very son, love itself so fully, that the inevitable abuse of that love would lead to his suffering and death. Jesus knew the inevitability of his death, yet, he did not desire it or seek it out, but as we know, he accepted it for the carrying out of His father’s will and for the service of God’s love and mercy to all. While love ad mercy might at time lead to suffering and even death, god is not angry or vengeful but loving and merciful for all who reach out to him. Those who call out to him are the poor, the suffering, the marginalized. The self-sufficient don’t need God, wouldn’t recognize him if he reached out to him. In Jesus’ time the chief priest, the elders, the scribes were so self contained that they could not see God acting in their midst. Their eyes could not see. A way to understand God’s love is to look at the love in marriage. The love is a giving, a sacrifice of self to become a we, one in a new union with love as the center and reason for life together. In sacrifice and love and giving, two grow and mature and live together in a new and different way. The joys out weigh the sorrows for the most part, but in the end, love holds it all together. Their relationship is steeled and strengthened through many good things and through the hard and bad things as well. So it is God’s love reaches out and shares itself with us in all things, God’s love never fails, unless we fail in our love for him.